Located at 85 Boulevard Anspach, one block south of the Bourse in central Brussels. It was built in 1913 as the Theatre de la Bourse and was located in a vast complex which included a Winter Garden and four bars. Seating was provided in orchestra and two balconies and originally the rear of the orchestra level of the auditorium had restaurant type seating with tables. It was converted into a 2,500-seat cinema after World War I and re-named Pathe Bourse Cinema. Alterations were carried out in 1951 when it received an Art Deco style make-over. By 1965 it programmed childrens films. This continued until 1972 when it was re-named Pathe-Palace Cinema and played general release films until it closed in the late-1970’s. It was taken over by a German company in 1995 and they set about restoring the building. Unfortunately the decorative treatment of the entrance foyer and auditorium had been removed, but the two-level upstairs foyer space retained its decorations. It reopened in 1999 as the Kladaradach Palace Cinema after being closed for two decades. It’s last incarnation as a cinema was with 3 small screens screening Hollywood hits and Flemish feature films. Sadly that venture didn’t last too long and it became the 400 capacity; Palace nightclub. This closed in the early-2000’s. The building then remained shuttered, and in April 2013, renovation work began to enable the building to re-open as a 4-screen cinema, planned for 2015. By May 2017, the renovation worked had halted and the building was sitting unused. In September 2017 renovation work had recommenced and the 4-screens were constructed in what had been the 2nd balcony level. The former two-level foyers which once served the balcony & 2nd balcony were lovingling restored to their original 1913 splendour and will be used as a space for receptions and special events. The former orchestra level and balcony have been removed and the basement opened up to form a huge atrium which rises to the underside of what was the 2nd balcony level. When seen in May 2018 an exhibition space in the basement had a display featuring the refurbishment of the cinema. It re-opened 28th February 2018 as the Cinema-Palace with a sold out presentation of “Hannah” starring Charlotte Rampling, who attended the opening in person. The Cinema-Palace also boasts a restaurant & bar. Films are presented in their original language versions. 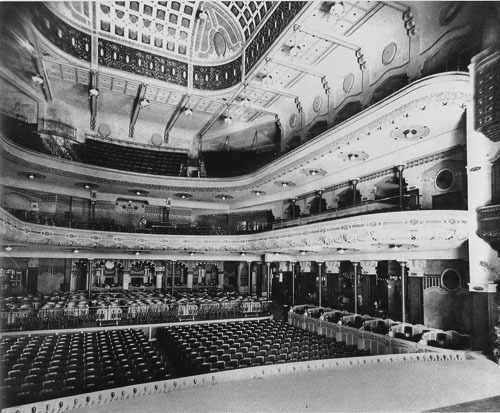 An interior picture of the theatre’s interior when it was the Pathé-Palace.